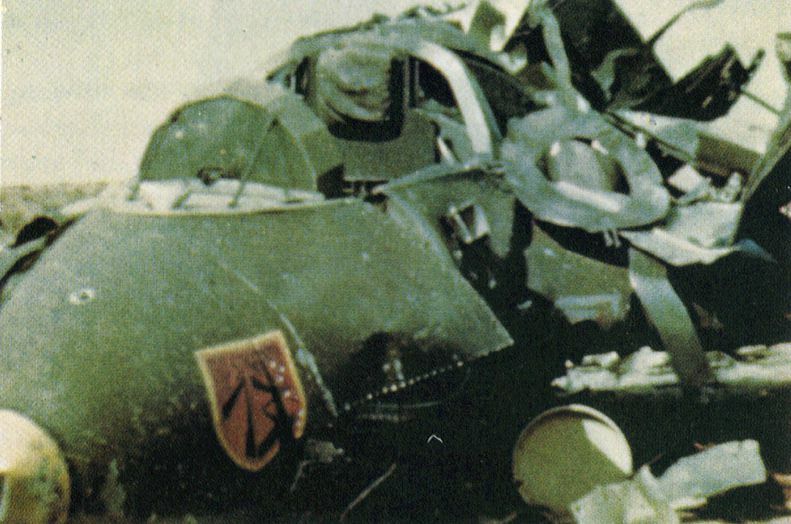 Airfoil caption: The Brown-Violet 81 and Dark Green 82 camouflage colors of this Me 163 have been applied in a slightly different way. In this case the Dark Green 82 has been sprayed solidly over the nose, and the Brown-Violet 81 has been softly sprayed over it. The nose is painted Gelb (Yellow) 27. The metal parts of the cockpit are finished in Schwarzgrau (Black-Grey) 66. From the appearance of the damage it looks as if this plane was also destroyed by the Germans. Personally I don't see the 81 sprayed softly over the green; to me it looks like a solid green. The badge seen on this aircraft 'Die Schwarze 13' is rather confusing. One option is that this is the badge of the 13. Staffel. Another is that this specific aircraft was 'Black 13', and its ominous coding asked for a special badge.